Feadship have announced their second launch in 2013. 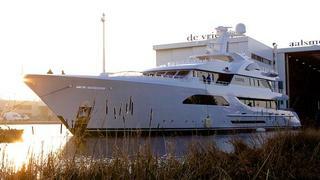 Following the 99m project Dream last month, the prestigious Dutch yard has launched the 57.6m superyacht Larisa. Previously known under the hull number 685, Larisa has a contemporary exterior design by De Voogt Naval Architects. Her sleek design is characterised by curvaceous lines and the feeling of a long foredeck is reenforced by the presence of the two 7-metre tender garages forward. The interior, designed by Bannenberg & Rowell, took in influences from Greece, Italy, the Riviera and the Byzantine Empire. Entirely customised to the owner's wishes, special details can be found like a circular dining area with sliding round doors on the bridge deck aft, allowing al fresco dining. Also, glass was used for the stairways sides, and bulwarks were lowered to reenforce the open feeling. Larisa accommodates eight guests in four cabins: a master suite, a VIP and two doubles. Crew quarters are for 12, and special features also include an inboard balcony in the owners’ lounge on the main deck easily accessible without the assistance of crew via push-button controlled doors. Powered by twin 1,140kW MTU engines, Larisa will reach a top speed of 15.5 knots and a transatlantic range. Larisa will be delivered in time for the forthcoming season.